Seeing summer’s bounty overflowing the produce stands at the farmer’s markets and grocery stores is one of the many reasons I love summer. 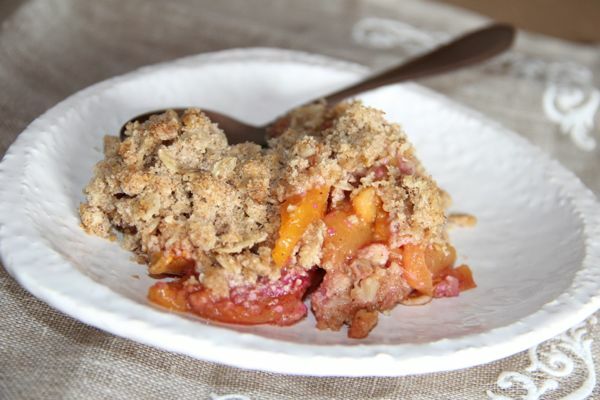 A fruit crisp is such a simple dessert that nicely showcases the fabulous fruits of summer. In this recipe we lowered the fat by significantly decreasing the amount of butter that typically goes into the crisp topping. We even switched from butter to coconut oil. The sugar content is kept low by decreasing the total amount used in the recipe. Since ripened peaches are so sweet on their own, we omitted any sweetener in the fruit base. Using oats, wheat germ and white whole-wheat flour improves the nutrition profile as well. Enjoy this decadent tasting and simple dessert that is also healthy! Peaches are a good source of vitamins A (beta- carotene) and C. They’re also an excellent source of fiber, good for blood sugar and keeping cholesterol low. A light, healthy dessert for summer. Preheat oven to 375 degrees F. and prepare a pie dish by spraying with nonstick cooking spray. In a medium bowl lightly toss peaches with lemon juice, cinnamon and nutmeg. Arrange peach slices in the prepared pie dish. In a small bowl, combine the wheat germ, flour, oats, sugar and cinnamon. Pour coconut oil over and with your fingers blend the mixture with the coconut oil. Sprinkle the flour mixture on top of the peaches and bake for 30 minutes until the peaches are soft and the topping is golden brown. Excellent article, I love smoothies, too, and they are a really good way to get my kids to eat healthy things that they wouldn’t otherwise. Heading over to check out your banana oat smoothie!